Our site for Showy Lady Slippers was unproductive this year for us. Will check earlier in the season 2019. When we visited Garden in the Woods outside Boston in June we saw few ladies’ slippers, so I can surprisingly confirm what you say. Add my Texas observation, and we can both say it hasn’t been a good year for ladies. I bet 2019 will be better. I need another cup of coffee it seems. I first read that to be, “what an exciting fellow I am”. I wondered what that meant. After reading again, I realized my misread and had a good laugh. I have never seen this plant in our neck of the woods. It’s a beauty! 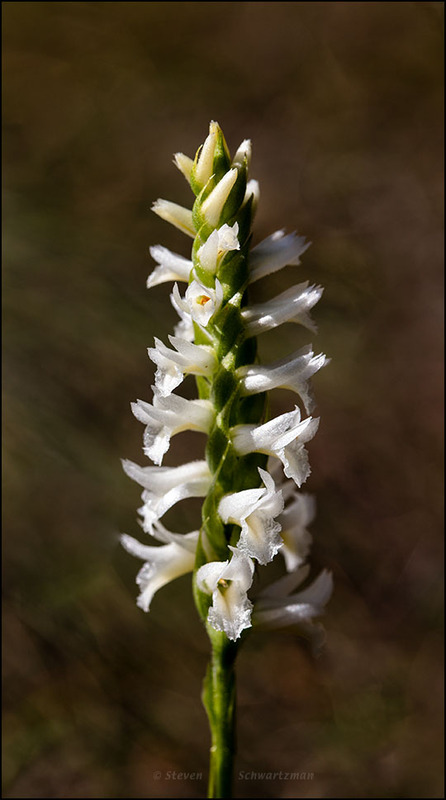 http://bonap.net/Napa/TaxonMaps/Genus/County/Spiranthes and you’ll see that half a dozen Spiranthes species make their home in parts of Oklahoma, so you may yet find one, especially now that you’re aware of them. Wow! Thanks for that link! Mostly I try to identify plants that exist here on our property and all along the Washita river. I’m usually surprised to find a species I don’t expect to see out in the wild. We do enjoy drives taking in the countryside or in the Wichita Mountain area too, where I see many plants I’m not familiar with. The BONAP maps are an excellent way to find what grows in which counties. As long as you know the genus, you can see where all the species are. Every area has hundreds of native species, so there will always be new discoveries, even near home, but especially, as you point out, when driving farther afield. Just 25 miles east of Austin the soil changes significantly, and various plants grow there that don’t grow in Austin. I found my first ladies’ tresses orchids in Arkansas, just south of the Ouachitas in the Pond Creek wildlife management area: not far from where you’ve spent time. They were thick there, and it would have been October that I saw them. That’s what I think of these orchids. I look forward to them every fall. In the four years we’ve birded, there’s been a notable absence of species in our yard habitat .. and beyond. Comparing now from year to year, the searches are not as fruitful. Could it be the wildflowers are disappearing too? With regard to ladies’ tresses orchids, I don’t think so. Based on my (admittedly limited and local) observations, Spiranthes magnicamporum fluctuates quite a bit. In some years at the site in my part of town that I check out each fall I’ve found maybe a couple of dozen; in other years, like the current one, I’ve found none or just a few. A native plant person I know who lives about 20 miles to the west of Austin told me she also saw fewer of these orchids this year than she’s used to. Lovely image, the directional light suits the beautiful flowers. this portrait strikes me as the most Rembrandtesque. Ladies’ tresses have been noticeable by their absence here, too. This fall has been splendid for many species, but in all the places where I’ve found the orchids in abundance — Nash prairie, my personal little hayfield, Brazoria NWR — I haven’t seen a single one. On the other hand, they were abundant in the spring. I think it’s only a natural cycle. Last year, there weren’t many at all in the spring, but there were quite a few sighted in the fall. That unpredictability is part of what makes finding them such a delight. This species looks different enough from those I’ve seen that I pulled out the Liggio book for some comparison. Indeed: this isn’t a species found here, and the flowers are a bit larger than the ones I’m accustomed to seeing. I noticed that the Piney Woods is awash in species. That’s a piece of information I’ve filed away for future reference. This is as close to a perfect orchid as I’ve seen. The ones I find never are so straight and unblemished. The background is perfect for it, too: rich and painterly. It’s good to get your report from 200 miles east in addition to the one from 35 miles west of home. This year’s weather from summer into fall just hasn’t been conducive for ladies’ tresses orchids. Spring seems to have been a different story for you, but as far as I know we have no spring-blooming ladies’ tresses species here. Sounds like a trip through the Piney Woods is in the offing for you. I’ve had the Liggio book “forever” but I often forget to refer to it. I’ll have to do so. Oh, and as for “painterly” with respect to the background in today’s portrait, you may have noticed that in an answer to the previous comment I said the image strikes me as Rembrandtian. I was so taken by the orchid, I missed that. I can see it, although it was Vermeer who came to mind when I looked at the photo. Vermeer or Rembrandt, you won’t get in dutch with me. Hi Steve! We went to Wild Basin on Black Friday to #optoutside and saw around 20 or so! Most I’ve ever seen there. Wow, that’s encouraging. Seems like November 17th, when we visited, was early rather than late. I was aware of your two-part program and hope it went as well as you expected. I will take one beautiful lady’s tress over none at all. Hmmm is one called a lady’s tress, or a lady’s tresses, or ladies’ tresses. This lady’stressing about it. Not really, but I am wondering. With regard to numbers, a friend commented that when she went to Wild Basin a week after Eve and I did she saw some 20 ladies’ tresses. And that brings up the question of singular versus plural, and whether or where to put an apostrophe. I pulled out a dictionary from 1971 and found the first definition of tress, ‘a plait of hair, a braid,’ marked archaic. Complicating the situation is the fact that the word was usually used in the plural. Though I’ve settled on ladies’ tresses, in print I’ve seen various ways of writing the phrase, so any lady’s stressing would be distressing. Ah, well I will relax and set my tresses free. Then you shall be among the mistresses of tresses. This reminded me my local Dendrobium orchids at my garden, couldn’t care for them for several months because I was busy with my fruit farm. I hadn’t heard of Dendronium orchids, so I searched and found that “There are over 1,000 types of Dendrobium orchids and hybrids.” It sounds like now they’ll be the fruits of your labors for a while. Thanks. I’m happy, too, that I was so exacting with that directional light. What joy to discover such a perfect specimen and have the skill to capture it so perfectly! Who could ask for anything more? Seriously, I was happy to find this specimen, given how sparse the species was in my part of town this year. I’m sure you do! They were in short supply here too this year, I didn’t come across even a single one. A couple of autumns here have been like that. Usually, though, there are at least a few ladies’ tresses.